I travelled with my family on a camping trip to North Carolina, and we were fortunate to be able to see the solar eclipse on Monday, August 21, in totality. 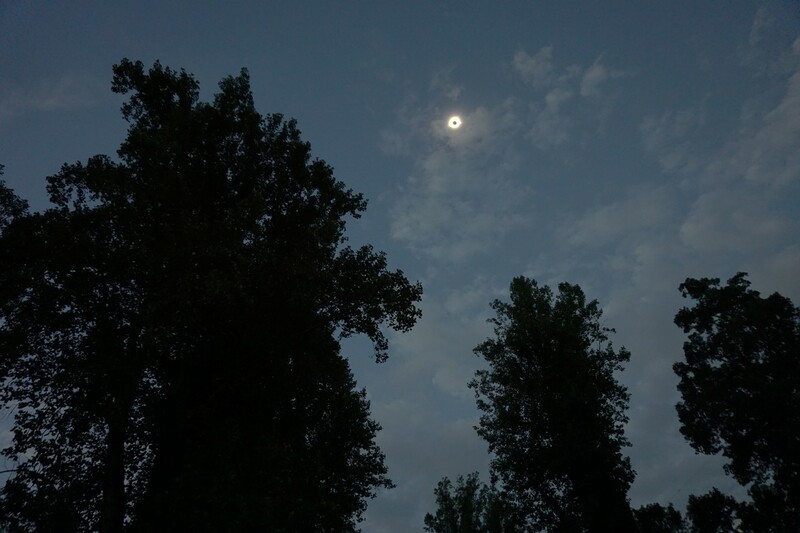 The timing worked out well, and although this was further than my typical distance on a camping trip, it was worth the effort to view the full eclipse. Seeing the eclipse in totally vs. only partially (even at 99%) doesn't compare, as the effects are much more impressive when its in full. I had heard this point, but agree with it strongly now that I've experienced it. Our campground was located in Old Fort, North Carolina, east of Asheville. 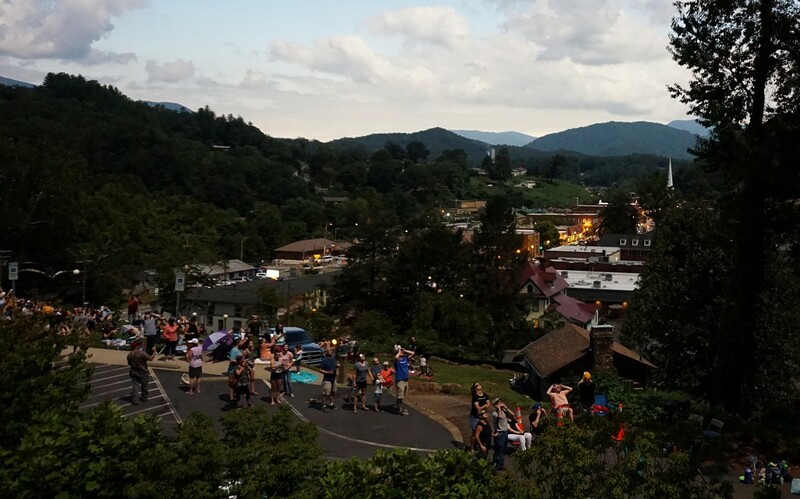 We had to drive about an hour west, past Asheville, to get to the full eclipse zone. 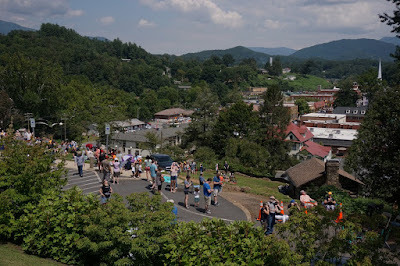 We headed out in the morning, had some traffic, and arrived at Sylva several hours prior to the eclipse. I had chosen Sylva as it is a picturesque town and there were activities related to the eclipse throughout the town. 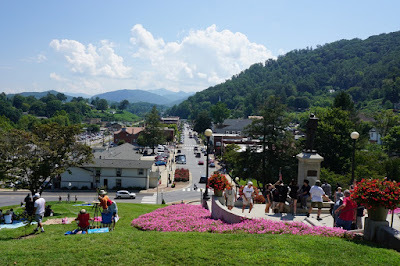 Sylva is located in the area near the Great Smokey Mountains, and the drive there is really pretty and mountainous. 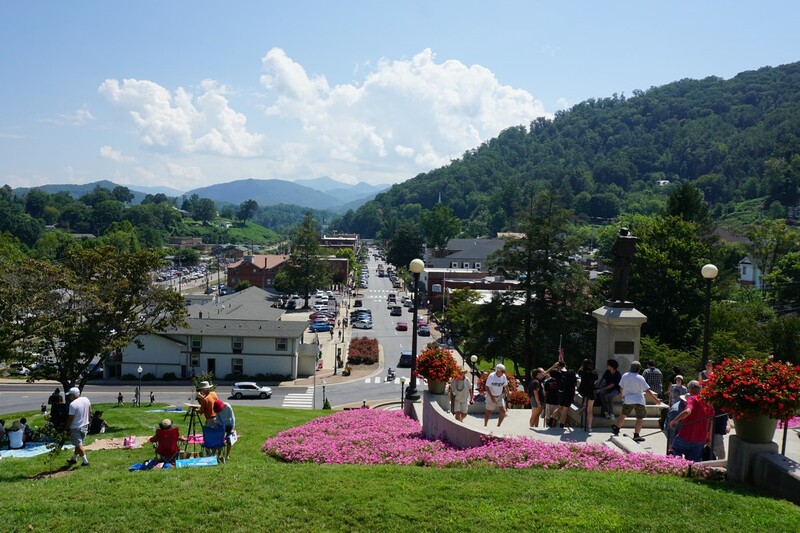 Sylva itslef is nestled among the large mountains of the Appalachians. 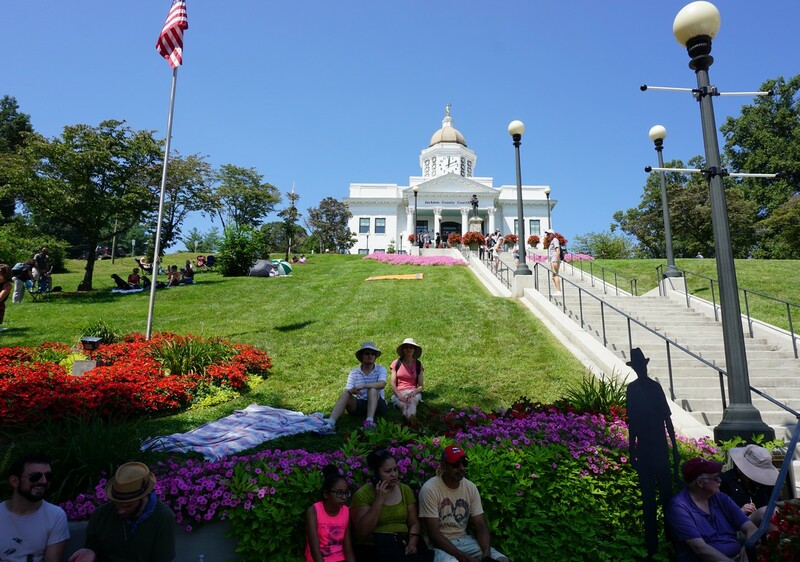 We parked on top of the hill right next to the Jackson County Courthouse, which overlooks the entire town, and this ended being a great place to experience the eclipse as we saw the full town darken and lights go on. 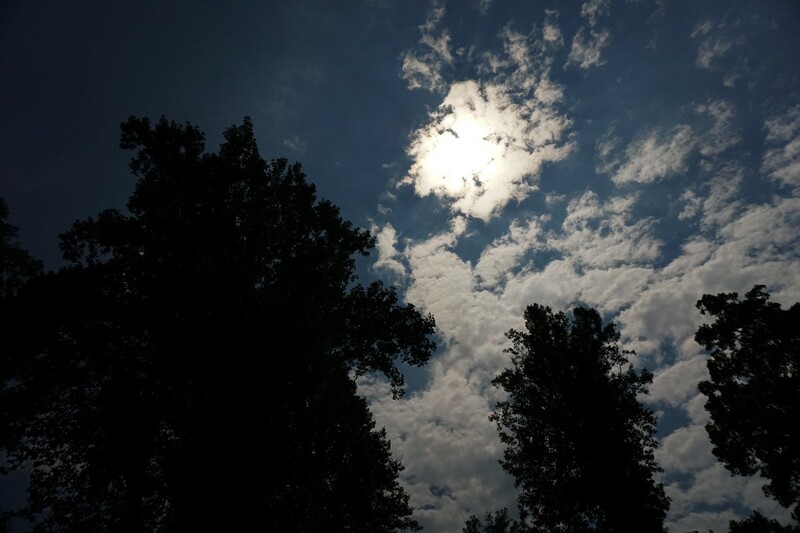 The start of the partial eclipse began at 1:06 PM, and totality was reached at 2:35 PM. 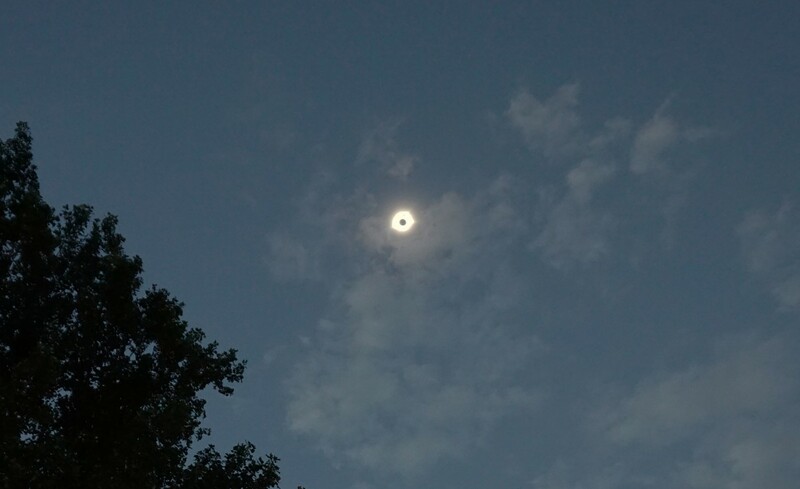 The totality lasted for 1 minute and 44 seconds. Up until 10 minutes prior to the totality, it may have been slightly darker, but you really don't notice anything without looking through the eclipse glasses. It's only as the totality approaches does it really start getting area, and then the totality it really gets dark, like at 10 minutes after sunset! There were crowds of eclipse tourists throughout the town. Thousands of people descended here to witness the event. 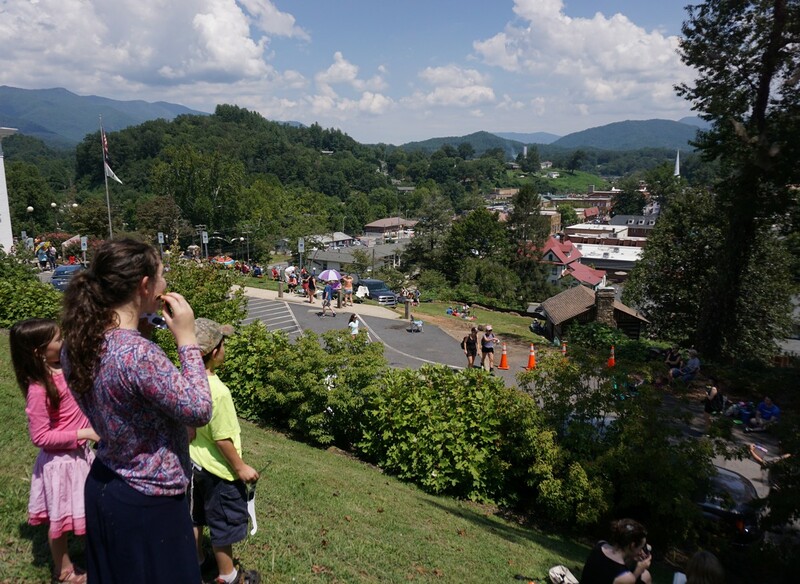 When totality was reached, a tremendous cheering was heard throughout the town, and then another booing when the totality had ended. Once the totality ended, within 20 minutes almost everyone started heading out, presumably to beat the traffic. 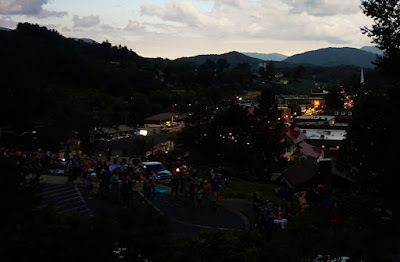 It was no avail, as the roads were almost entirely stopped for hours well into the night. It took almost three hours to return to our campsite for a one hour drive! But it was still worth it as this is a once or perhaps twice in a lifetime event to witness. I took this photo with a Weldler's Glass over the Camera. Eclipse is Nearing Totality. Also taken Through a Welders Glass. 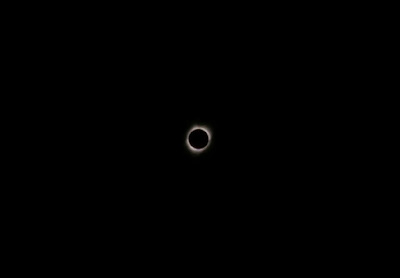 Getting close to Totality. 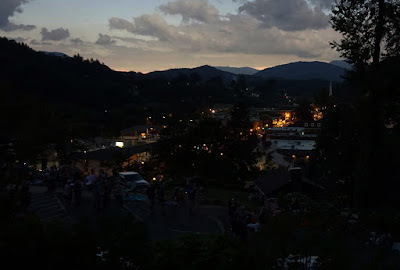 Darkness is Descending Over Sylva. The Actual Eclipse. The Photo Adds much more Sun Halo than in Actuality.